No one on board the tram, which was, moving away from the centre of Milan, knew anything as yet. The time was a little after five o’clock on the afternoon of another Friday in the run-up to Christmas. But this was no ordinary Friday. This was Friday 12 December 1969 and less than half an hour earlier, at 4.37 pm., a bomb had taken the lives of 14 people (a further two died in hospital) and injured about one hundred. It was a massacre, as the first helpers to reach the scene were to say. 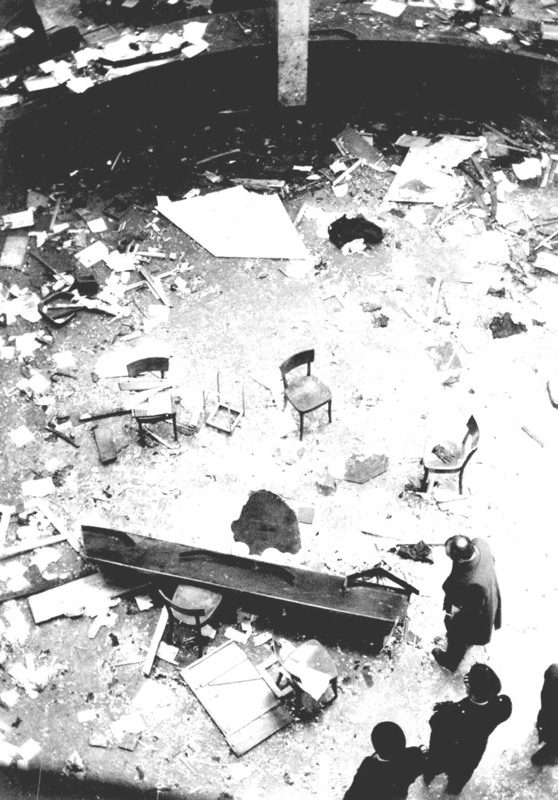 The Piazza Fontana bomb was not the only one. Another device was found close to the Banca Commerciale Italiana in the Piazza della Scala. At 4.25 pm., an employee of the Banca Commerciale, Rodolfo Borroni, spotted a black bag abandoned near the entrance to a lift and picked it up in the belief that it belonged to some absent-minded customer. The bag was heavy. Borroni opened it, together with some colleagues, and discovered a metal box inside, a rectangular plastic envelope and a black disc with graduated markings from 0 to 60. Nothing else. Someone suggested it could be a bomb. 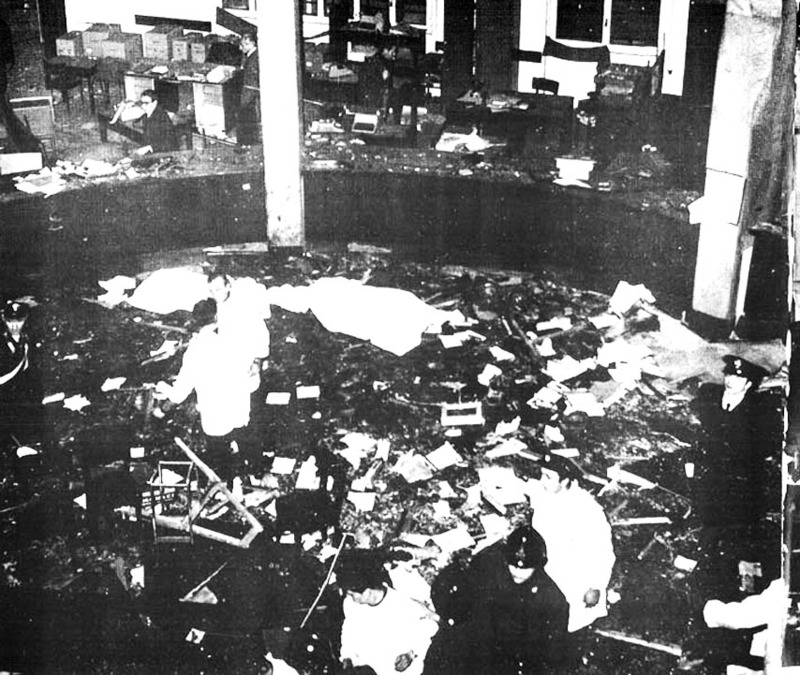 Brigadiere Vincenzo Ferrettino took the bomb into the court-yard and placed on the ground. It was a crucial piece of evidence, but four hours later, at 9.00 pm, Teonesto Cerri, engineer and ballistic expert, attached a TNT charge to the lock and blew the bag up. This was one of the first mysteries of that 12 December, one which was quickly followed by another. Almost two months later, on 7 February 1970, it emerged that in the bag containing the bomb there was a piece of coloured glass that the Milan police forwarded to the Criminalpol in Rome for forensic examination. Analysis showed the glass was similar to that used in Pietro Valpreda’s workshop in Rome where he manufactured liberty lamps. Valpreda was a Milanese anarchist who had recently moved to the capital. The sequence of explosions on that incandescent day ended in Rome. Between 4.40 pm. and 4.55 pm, in an underground corridor at the Banca Nazionale del Lavoro in the Via Veneto, an explosion injured 14 of the bank’s staff. Within the space of ten minutes, after 5.20 pm., two less powerful devices exploded at the National War Monument in the Piazza Venezia. This time only four people were injured — one carabiniere and three passers-by. And so ended that day of massacre. Radio and television broadcast their first reports while newspaper sub editors decided on the banner headlines for the following day’s editions.